This Vegas-style slot machine from Playtech will appeal to music lovers. It has three reels and five win lines. The symbols are represented with music-themed accessories: Guitar, Harmonica, Drum, Platinum Record and Gold Record. Identical symbols that drop on the reels after they have come to a stop grant a cash prize. 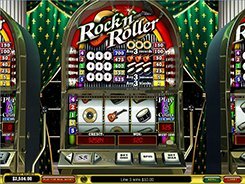 All combinations and winnings are specified in the Paytable above the reels. 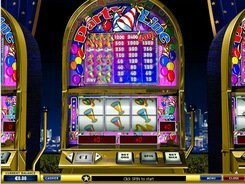 The slot accepts one coin per line with a coin denomination of $0.05 to $5, so the highest bet per spin stands at $25. The maximum payout of 700 coins is given for three Platinum Record symbols landed on an enabled payline. All in all, the slot machine has 12 paid combos with various paying values. PLAY FOR REAL MONEY!